A chronic liver disease which causes damage to liver tissue, scarring of the liver (fibrosis; nodular regeneration), progressive decrease in liver function, excessive fluid in the abdomen (ascites), bleeding disorders (coagulopathy), increased pressure in the blood vessels (portal hypertension), and brain function disorders (hepatic encephalopathy). 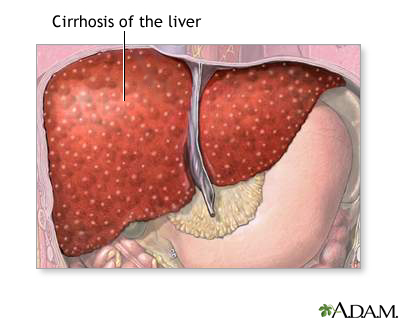 Excessive alcohol use is the leading cause of cirrhosis. Updated by: Jennifer K. Mannheim, ARNP, Medical Staff, Department of Psychiatry and Behavioral Health, Seattle Children's Hospital, Seattle, WA. Also reviewed by David Zieve, MD, MHA, Medical Director, Brenda Conaway, Editorial Director, and the A.D.A.M. Editorial team.